Welcome one and all to a new blog run by an effusive undergraduate studying Cognitive Neuroscience at Penn! I’ll be writing about the social role of neuroscience and related issues, in particular as they are explored by Penn’s Center for Neuroscience & Society, where I work – for details, check out the ‘About’ section. I’m starting off with a CNS event I’ll be covering regularly: the Public Talk Series, monthly lectures on neuroscience and social issues. This year’s series kicked off Oct. 4 via a special collaboration with the Penn Museum, entitled “From Skulls to Scans: How Brain Measurements Have Been Used, Misused and Misunderstood in the Study of Racial Differences.” Drawing from the Museum’s famous Morton skull collection as a starting point, anthropologist Janet Monge, neurologist Geoffrey Aguirre and Penn Law faculty member Dorothy Roberts examined the way neuroscience has historically been (mis)used in social constructions of race. The talks centered on the controversial attempts of Samuel Morton – a 19th century Philadelphia physician and Penn graduate – to align skin tone with brain profiles and intelligence ratings. The famous evolutionary biologist Stephen Jay Gould once critiqued Morton’s work as suffering from biased measurements, but the panel came to a different conclusion: Morton’s measurements were physically spot-on. It was their interpretation that created the problem. Monge pointed out that since Morton’s research questions were biased, preemptively assuming certain behavioral differences between races, his technically correct methodology could not be put to good use. Aguirre then put the issue in contemporary context by overviewing modern methods for studying group differences. He noted that although new technologies – particularly fMRI – are far more advanced than the tools available to Morton, they still leave room for error and are equally helpless in compensating for researcher bias. In other words, as long as researchers begin studies with already defined group differences in mind, their interpretations will be skewed, no matter how fancy or technically accurate their methodology. Finally, Roberts gave a sociologist’s insight into the sorts of biases that seep into superficially scientific studies of race. For example, she discussed the notion that biological explanations for perceived racial differences can make social inequalities seem inevitable and therefore acceptable, and how this notion might drive interpretations of data to support existing stereotypes. All this discussion made the broader point that data interpretation is not necessarily neutral to researchers’ biases, especially in a topic that can be as socially charged as group differences. Which brings me to a study published this month in the PNAS journal on the brain and reading ability, a trait often used to sort children into groups at school. Researchers at Stanford University have reported a correlation between white matter development in children aged 7-12 and their performance on standardized reading assessments. On the one hand, this is an interesting addition to the growing body of research on child brain development that may relate to and even benefit education. If this study can shed light on when to start reading interventions, or which cognitive processes interventions should target, that could be good news for educators. On the other hand, much like with studies of brain anatomy and race, these results could be fodder for careless misinterpretations – e.g. deciding that brains scans will tell you whether or not a child should be in the advanced reading class for the rest of her time in school. The difference between those interpretations lies in an appreciation of nuance and an avoidance of pre-existing stereotypes (which in this case might include, say, the belief that “low-performing” students can never improve). And as Monge, Aguirre and Roberts pointed out, nuance and open-mindedness are crucial to keep in mind when neuroscience takes on group differences. 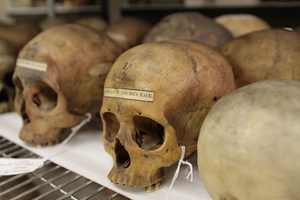 Heavy but important fare for the Public Talk Series’ inaugural lecture – and if you haven’t yet had the chance to do so, I recommend that you ponder all this while checking out those Morton skulls.